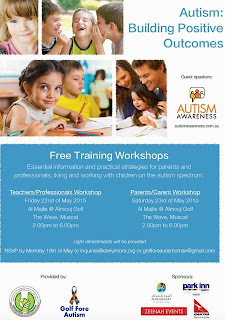 I've been asked to share these two, free autism awareness workshops that are coming in the next couple of weeks. They are FREE to attend for everyone. It is estimated that 1 in 68 children in the U.S. are impacted by Autism and there needs to be much more awareness within Oman to recognise and help affected children as early as possible. With early intervention children on the Autism Spectrum can reach their full potential and capabilities. 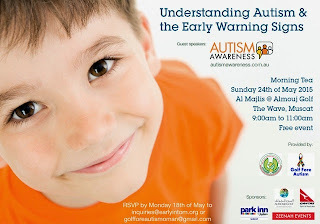 There are no statistics for the diagnosis rates of Autism in Oman, however a 2011 research paper attributed this to “the reported low prevalence of ASD in Oman is likely due to under-diagnosis and under-reporting”. Good work to the HM grant autism research team for bringing this forward, totally, and volunteering so much of their personal, unpaid for time.